Shrub Rose Care - GreenScapes Garden Center & Landscape Co.
leaves early to minimize mildew. A southern exposure that receives morning sun and late afternoon shade is ideal. Roses require good drainage. Roses and wet areas do not mix. At the same time, roses do not like to be dry. To help prevent diseases, the area you choose for your rose should have good air circulation so that the foliage dries rapidly. 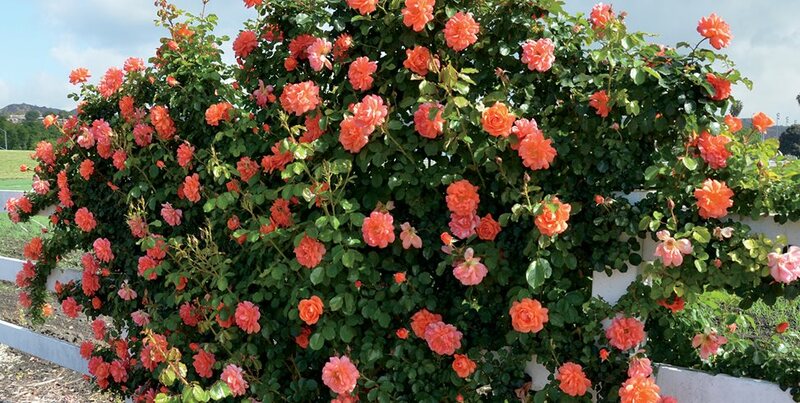 Leaves of other plants should not touch the roses unless you are forming a hedge. along the side of a building or fence. The planting hole should be 12 to 18 inches deep and twice the width of the container. The bud union of your rose (a “bump” at the top of the roots) should be 1 to 2 inches below ground level. Roses like a soil that is acidic. A soil test kit will easily show you if your soil is acidic or not. A pH of 6.5 is best for roses. A soil mixed with peat moss and composted manure is an ideal medium. at the base of the plant until the area is thoroughly wet. Watering times will vary depending on the size of the rootball. above, do so early in the morning so the foliage has a chance to dry. This discourages disease. There is always a chance of over watering also, again the best thing to do is to check your soils moisture level. Fertilize when plants are in full leaf in the spring. Fertilize again after the first bloom. Fertilize again in the early part of August. For proper hardening of canes for winter, do not fertilize late in the fall. fertilizer applications for any product you choose to use. Roses should be pruned to promote their health, vigor, and directions - to tell them how and where to grow. Pruning gives the plant a shape, a style, removes unproductive wood and provides good air circulation. The best time to prune is before new growth starts in the spring. Fall pruning is necessary only when plants are extremely tall, to prevent wind damage during the winter. Any pruning shear with a sharp curved blade will be less apt to cause injury to the canes than a straight-cut pruner. Long handled lopers should be used for larger canes. Weak or diseased canes should be the first canes removed. Winter-damaged wood, which looks brown on the outside, light brown and dry when cut, should be cut off 1 to 2 inches below the damage. Any branches crossing or rubbing another should be removed - always leave the newest, healthiest canes. If you are not sure what to cut, wait. You can always make more cuts later when the bush has leafed out and you can see its shape more easily. Trim twiggy top growth by about a third so you can see the structure of your plant. Take out dead wood, canes that cross the center of the bush, and any shoots (suckers) growing below the bud union. Shape the plant by removing some canes. You are safe in cutting back to 5-10 strong canes. Cut ¼” above dormant bud eyes that face the outside of the bush. New growth will come from these eyes. Strong, healthy roses are the most resistant to winter damage. Leave the last blooms in the fall on the plant to form hips. This will slow growth and help them go dormant. Rake off and remove all leaves from the rose bed to prevent diseases. An application of dormant spray or oil will help get rid of diseases that might return in the spring. Even during the winter your roses will need water. You should water your roses just before the ground freezes and any time there is a thaw with no rain or snow for more than a few weeks. Roses should be winterized just before the ground freezes hard, usually late November. In the fall, roses do not need to be trimmed unless they are liable to be damaged by winter winds. Apply a final spray or dust to the canes and soil surface. Cover the crown of the plant with a soil mound about 6 inches high, then cover the entire plant and soil mound with hay or straw. For our winters it is suggested to stake the canes to the ground and to cover them with straw. Cover the base of the climber with soil, then tie the canes and wrap them in burlap to protect them from whipping in the wind and drying out.